Temperature and humidity testing determines how components, subsystems and complete systems behave in severe environments that involve elevated temperatures and high or fluctuating relative humidity. The tests can be static with constant temperature and humidity, they can involve the cycling of both, they can be temperature-humidity bias tests (where the moisture is used to induce a failure in an electrical device) or some combination of all of these. Among other things temperature/humidity tests study the effects of climatic changes on electronic components such as failures due to parameter shifts, mechanical failures (due to rapid water or frost formation), optical failures (fogging), water tightness (package) failures, material degradation (epoxy coatings, etc.) and much more. Temperature/humidity tests are a critical component of a complete qualification program. Many electrical components, while inexpensive to purchase, may be expensive to replace. For example, an LCD on an oil exploration device or a marine instrument can cause serious down time costs in a temperature/humidity related failure. Temperature and humidity combined testing extends to complete systems and finished products that extend beyond electronic components: copiers, computers, automobiles, satellites and even parachutes require temperature/humidity testing. In today’s engineering and manufacturing world, it’s insufficient to just design, create and distribute products. Manufacturers have a responsibility to make sure their products will withstand all the environmental pressures and stresses they’ll be exposed to once they’re employed in the “real world.” Two of the biggest environmental influencers determining if products will stand up are temperature and humidity. Fortunately, today, there are advanced forms of temperature and humidity testing available to all designers and manufacturers that ensure optimal product performance. Temperature testing and humidity testing work hand-in-hand. These two environmental forces are inescapable on earth, except possibly in a vacuum that simulates conditions of outer space. But in the terrestrial environment, every manufactured product from military munitions to electronic components will experience a range of temperature and humidity conditions. Some of those ranges might be extreme. Environmental changes in things like temperature and humidity strongly influence manufactured product performance. It can be exterior conditions where weather factors change with fluctuating seasons or artificial environments where room conditions influence products. As well, adjacent products in contained environments also affect how the others perform. Professional temperature and humidity testing accounts for all these interactions, and the testing process is performed to help improve the long-term durability and service life of products. The manufacturing industry utilizes temperature and humidity testing to get an accurate view of how their products will perform in any environment. This process serves to establish product reliability as well as ensure regulatory compliance. HONGZHAN has been performing climatic testing for over 15 years and we understand the wide breadth of temperature/humidity testing needs. Consequently our test chambers have been assembled and kept up to date to satisfy every conceivable requirement. Contact us today to learn more about how HONGZHAN can help you achieve your Temperature and Humidity Testing goals. What Is Temperature and Humidity Testing? Temperature and humidity testing is an umbrella term. It’s an engineering and manufacturing generalization for a host of environmentally stressful experiments such as high/low temperature testing, moisture resistance testing or temperature cycling testing. Procedures like temperature humidity bias testing also fall under the umbrella. Regardless of what each test type is called, they all determine how manufactured products’ complete systems, sub-systems and individual components perform or behave in normal and severe environmental conditions. For the most part, the extreme variations are in temperature and humidity. However, other environmental factors like sand, dust, corrosion and vibration also fall under the performance testing umbrella. The basic premise for temperature and humidity testing is to place products in elevated environmental stresses and induce failure. There’s a wide spectrum of forces applied during temperature and humidity tests, and they depend on the particular product and its intended use. Testing technicians place subject materials in controlled environmental test chambers, then artificially adjust temperature, humidity and other forces. These high and low parameter shifts may cause products to fail mechanically, fog or condense, allow water ingress as well as degrade structural materials. Manufacturers place temperature and humidity testing as a high priority in quality control programs for several good reasons. Properly conducted, environmental testing puts products at the outer limits of any natural or artificial conditions they’d realistically face. For example, electronic assemblies and components are top candidates for temperature and humidity testing. Experienced manufacturers know that it’s far better to have parts fail in a test chamber than during an operational application where downtime and repairs might be prohibitively expensive. Testing simulation: Environmental test chambers artificially simulate or mimic conditions that products might reasonably experience in their eventual working environment. Normal-use environmental testing is a “test-to-pass” benchmark where regularly expected stresses like temperature, humidity, abrasives and vibrations are evaluated. If products meet the routine mark, they’re certified and sent to production and distribution. Testing stimulation: This testing procedure or method is a step above routine simulation. Environmental stresses are elevated to uncover product weaknesses and failure points. Conversely, stimulation of extreme stresses like accelerated temperature and moisture confirm a product’s ability to withstand environmental factors above and beyond anything they’ll see in their service. Testing stimulation is also known as accelerated testing. Temperature is the most common product stress found in environmental fluctuations. Temperature changes cause products to expand or contract. Rates vary depending on the type of material being tested. Plastics react differently than metals, and temperature testing parameters are always set according to the materials involved in the testing procedure. Humidity is the second leading environmental stressor affecting manufactured products. Humidity fluctuations cause expansion and contraction as well, but environmental testing technicians are more concerned about how humidity affects internal workings in products. Moisture penetration, or leakage, is a big contributor to oxidation and corrosion. Humidity resistance is a major performance consideration for products involving electrical or computerized mechanisms. Although most product testing procedures primarily focus on temperature and humidity, many testing chambers incorporate additional examinations. Vibration testing often accompanies basic temperature and humidity testing. Expansion, contraction, ingress and leakage actions often lead to compounded problems when combined with physical vibrations. Combined, the three stressors result in products losing mechanical strength from cracking, swelling, displacing and impairing physical properties. They add up to product fatigue and premature failure. Finally, the temperature and humidity umbrella can include additional tests for stressors caused by altitude or subsurface water compression. Corrosion is a constant concern for metallic products. Sand, dust and grit also contribute to wear on all types of products, no matter if they’re composed of metal, plastic or any form of composite material. Product testing through controlled and intentionally induced environmental stressors is the only way to artificially determine how well a designed and manufactured component or assembly will perform in its intended role. Diversely stressing products ensures that they’ll operate as intended during normal usage. The key to accurate product evaluation is in how temperature and humidity tests are performed. How Are Temperature and Humidity Tests Performed? Technicians perform temperature and humidity tests by immersing products in artificial environments. It involves testing chambers where temperature and humidity variations are induced, controlled, monitored and evaluated. 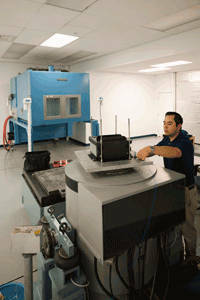 Test chambers often include vibration tables and apparatus regulating exposure to abrasives like sand and dust. Test chamber sizes vary. Some chambers are small and designed to test miniature components like circuit boards and controllers. Mid-sized chambers allow larger objects or multiple loads of small products for mass testing. Occasionally, extremely large candidates like vehicles and machines require temperature and humidity testing. Custom testing chambers are often built for these applications. Individual chambers have specially designed physical controls for temperature and humidity testing. The restrictions depend on the range of simulated environmental stressors that engineers expect a product could possibly endure. One of the most common temperature and humidity testing controls involves the 85/85 test. The 85/85 test uses a temperature and humidity testing threshold that applies to the vast majority of environmental evaluations. It involves setting test chamber conditions to an internal temperature of 85 degrees Celsius and a relative humidity index of 85 percent. This hot, humid environment can be held for as long as 1,000 hours, which many engineering evaluation specifications set out. The 85/85 test, which is also known as the damp heat test, attempts to simulate 20 years of moisture ingress into a given product. This number is an approximation parameter which is often boosted by implementing a bias application, or what’s called the Temperature-Humidity-Bias (THB) reliability test. Bias refers to an electrical induction of steady voltage to electro-activate the device or test subject. THB testing is especially applicable to objects exposed to corrosive factors. Highly Accelerated Life Testing (HALT): This testing process implements aggressive temperature and humidity rate changes. Highly accelerated life testing also uses multi-axis shock vibrations that greatly reduce testing time while remaining accurate on artificially inducing real-time stressors. HALT tests uncover product weaknesses and strengths much faster than passive chamber testing. This accelerated method detects flaws in the design and prototype stage and lets product engineers quickly react with positive solutions. Highly Accelerated Stress Screening (HASS): This temperature and humidity testing procedure quickly screens defective products and their parts prior to shipment. Testers use the HASS stress screening process for already designed and proven products that need a final quality control check before distribution from the manufacturing center. HASS is a similar test to HALT but is less aggressive. Thermal cycling is another term often associated with performing temperature and humidity testing. It involves exposing test subjects to a controlled cycle of varied periods of hot/cold and wet/dry. The length of exposure time and environmental extremes depend entirely on the type of product and its intended application. The last temperature and humidity evaluation commonly performed is thermal shock testing. It involves heating or cooling a product to its maximum range and then quickly reversing the temperature. Thermal shock testing is an extreme method. It’s usually reserved for products used in the military and the aviation industry, where components and assemblies experience severe climatic conditions. Every professional temperature and humidity testing procedure strives to meet and exceed industry standard certifications and specifications. Many governmental and non-governmental agencies prescribe testing thresholds and benchmarks for thousands of commonly produced products. Unique products also fall under guidelines and parameters set by regulatory and advisory agencies. The most commonly used product standards come from the U.S. Department of Defense. They’re referred to as the MIL-SPEC Defense Specification, the MIL-STD Defense Standard and the MIL-HDBK Defense Handbook. Each standard, specification and handbook item is extensively detailed, and they’re often used for civilian manufacturing testing controls. Temperature and humidity testing is the manufacturing industry’s leading method for identifying and rectifying weakness in all forms of products. Testing exposes weaknesses through high and low temperature, high and low humidity, thermal cycling and thermal shock. These sophisticated tests expose product vulnerability and predict product survivability. Epoxy coatings: Many products destined for harsh environments contain epoxy coatings. Temperature and humidity testing places epoxy-coated products in extreme stress, where any weaknesses through expansion, contraction, moisture ingress and surface corrosion or abrasion are exposed. Fogging: Sealed units like windows and windshields are commonly tested. Any product weaknesses quickly show when stressed to hot and cold cycles of damp and dry. Moisture fogging between layers is a sure sign of product failure. Water tightness: Products exposed to wet environments are excellent candidates for testing. Water leakage or ingress weaknesses become readily apparent after testing. Those failures can emerge quickly under testing, or they can take a long evaluation period. Mechanical failures: Changes in heat and cold cycles can take a toll on many products, often ending in minor or catastrophic mechanical failure. Testing is front-line insurance against products failing in the field and resulting in damage or injury. For over 15 years, HONGZHAN has temperature and humidity tested thousands of products. Our clients include the United States military as well as many civilian manufacturers providing products to the U.S. Department of Defense. We’re a privately held testing, inspection and product certifying company that leads the American engineering service and supply chain management market. HONGZHAN provides solutions through a trusted network of easily accessible testing laboratories that are fully accredited to provide professional testing services. This network includes testing laboratories and certifications houses. We work as a trusted team and an extension of our clients’ engineer and design departments. As a testing team member, we at HONGZHAN perform essential checks and balances across a wide industry field. Our engineers and technical specialists are proud to be problem solvers. We simplify complex tasks and take on challenges to produce fast, accurate results in testing for temperature, humidity, corrosion and every other type of product failure problem possible. Contact HONGZHAN today to request a quote on your product testing requirements. You can also reach us at 400-660-6488 or contact us online.